While on the subject of light infantry caps I thought I'd post a pic of me when I was in this excellent British Revwar group. I am the one levelling the musket - the location is the Ulster American Folkpark - photo Rosemary Jones. More photos of their various events on their gallery page here. I'm not an art historian but that doesn't stop me having theories. 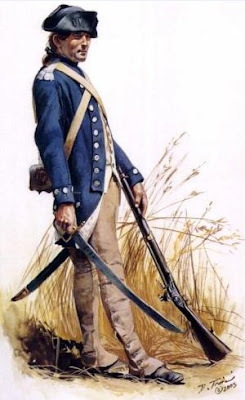 When we think of light infantry caps of the age of reason we tend to think of them as being primarily practical but I think there's another reason for their appearance in the American Revolution and that is the classical revival. So many of the distinctive caps of light infantry and dragoons seem to be based on ideas of Greek and Roman designs it could be an echo of what was going on in architecture. The legion as a concept was pretty popular in the Revwar also echoing the classical models of military excellence. 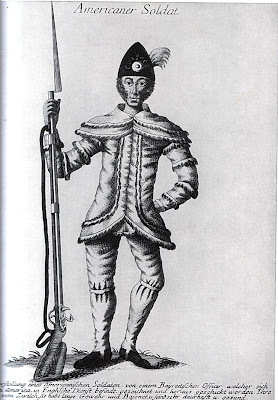 This image from Warley Camp in 1770s shows some of the fanciful headgear worn by British light troops - a long way from an item of practicality. I thought I'd better post a link to this excellent forum where I usually lurk. Native List is a semi-private Yahoo! 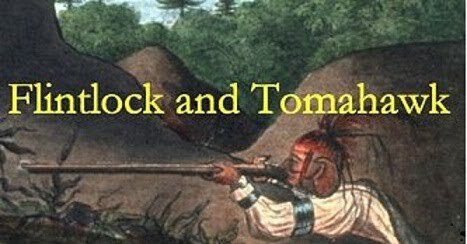 Group and email list for people involved in living history who portray 17th-early 19th Century Native Americans, mostly of the Eastern Woodlands' cultural groups during the 18th century. The primary focus of the list has traditionally been the Eastern portion of North America in the 18th Century. The scope also includes people who portray Indian Agents, Traders, or members of recreated military units that supported native operations, but not Indian Fighters. Discussion topics for the list center around the lifeways, outward appearance and re-creation of the material culture of Native Americans during this time period. Discussions are meant to improve the visible portrayal of natives of the time period within the context of Living History activities, so discussion of these activities is also considered on topic. While historically religion and politics were tied closely with native daily life, this list is neither a political action list nor a place to discuss religion. This was on the Nativelist forum - it's some fascinating images of various personalities from the era of the Vincennes campaign. Go here for these amazing images and their description. Supplyed to the Eastern Indians. The battle is technically the last one fought on British soil coming after Culloden. 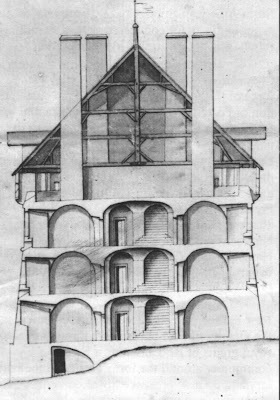 Bowles and Carver illustration. Fascinating picture presumably somewhere in England. I'm off for a while - to cure my compulsion for blogging I am taking the cure somewhere. See ya soon. 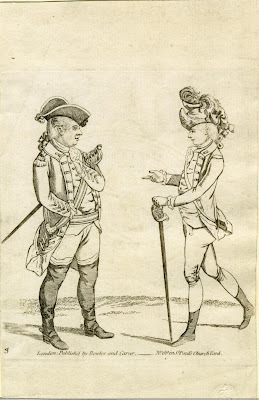 Of course I know very little about the type of person who was an officer in the British army but it's a good excuse to post these pics from 1761 and 1775 that have been knocking around on my desktop for a few weeks. 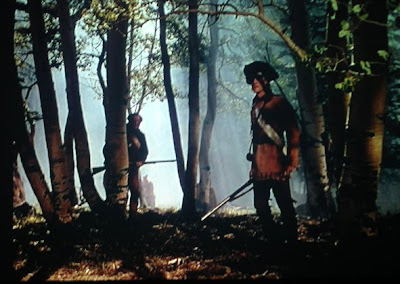 Talking of hunting calls reminds me of the character played by Richard O'Brien, an officer of the 17th Light Dragoons in Hugh Hudson's epic flop Revolution (1985). It was totally believable, a bit over the top and one of the best performances in this somewhat patchy film. The battle of Harlem Heights is also famous for the death of Thomas Knowlton. 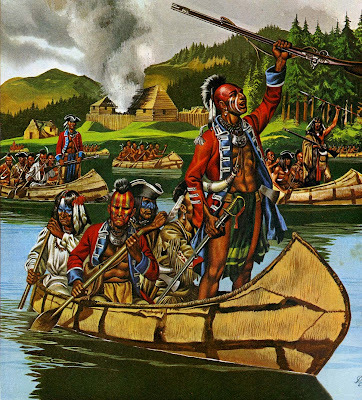 His unit, Knowlton's Rangers were an intelligence gathering force - effectively the first in the Americas. Article on spying in the Revolution. British troops made a tactical error by having their bugler sound a fox hunting call, "gone away," while in pursuit. 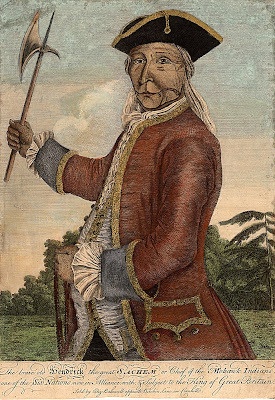 This was intended to insult Washington, himself a keen fox hunter, having learned the sport from Lord Fairfax during the French and Indian War. "Gone away" means a fox is in full flight from the hounds on its trail. The Continentals, who were in orderly retreat, were infuriated by this and galvanized to hold their ground. 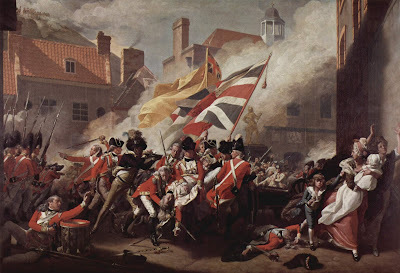 After flanking the British attackers, the Americans slowly pushed the British back. After the British fled, Washington had his troops end the chase. 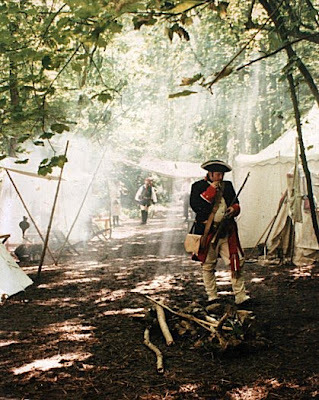 The battle went a long way to restoring the confidence of the Continental Army after suffering several defeats. It was Washington's first battlefield victory of the war. My Christmas card for this year sorted! How about this for a festive greeting? Photos and a write-up at Fraxinus' blog of last weekend's event and reenactment celebrating the Death of Wolfe. Some great photos and insights into the days' activities. Fraxinus is looking for a Wolfe figure in 28mm - there must be loads of manufacturers that do him - anyone out there know of any? While a squad of regulars sat eating their breakfast in a tent, a cannon ball passed through it, and killed one man instantly; and another by the name of David Foster, belonging to Capt. Cain's company, was struck on the temple bone by a grape shot, which passed under his forehead, rolled his eyes out, and left a little piece of the lower part of his nose standing; and what I thought was very remarkable, he lived to get home -- but how much longer I do not know for a certainty; though, about ten years ago, I was credibly informed that he was [then] living in the State of Massachusetts. This is a fascinating picture. I don't really know anything about it - probably someone has debunked it somewhere as not authentic but from what I know it was engraved by M Will of Augsburg based on a drawing of a 'Bayreitischen' Officer in the English service and is from 1778 or before. There is also a side view apparently that shows the mitre to have a rear panel as well. If anyone knows the whereabouts of that image or anything about this figure give me a shout. I don't really know much about American Militiamen's clothing during this period but this figure interests me. These are generally thought to not to have existed in this form in the French and Indian war period. If you want to read some period accounts and mentions of hunting shirts then check this site out. Also other subjects such as leggings and beards are covered here. In most British public libraries they have a Western fiction section. Not sure who reads them but they usually have lots of paperbacks with names like 'Gunfight at the Lazy X' or something like that but occasionally you happen across something interesting and that's how I discovered these fictional novels set during the timespan of this blog - so I will list them all so if you have a hankerin' for some good ol' paperback fun you can get them from some online bookseller for next to nothing. I can't say I would recommend them as I've only read one - the second in the series and it was OK but I'm not really a fiction fan so I can't be that critical so don't blame me if you find them rubbish or anything like that. I'm guessing they were popular as they wouldn't have made such a long series but there you go - you pays yer money you take your choice. Anyway this what I can find about them on the web. 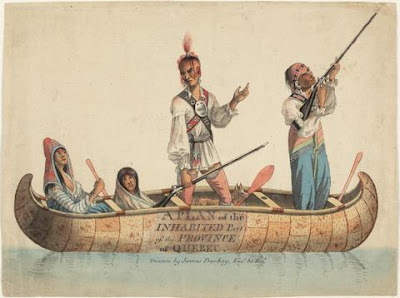 Founded the Iroquois realist watercolour genre. 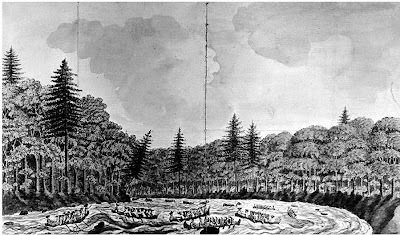 This image is of the creation story of the Iroquois League. Read David Cusick's 1827 booklet 'Ancient History of the Six Nations' here. I have to admit that I was pretty stunned by these new figures - not only are they in good poses but they also look (and I haven't seen these in the flesh) pretty historically accurate. 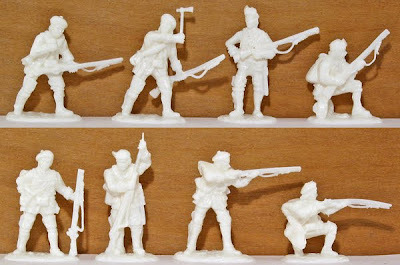 This is because the figure designers are already well versed in the F&I war - both John Jenkins who designed the Indians and Rangers and Frontline who did the French are well placed to produce top quality sculpts in this scale. 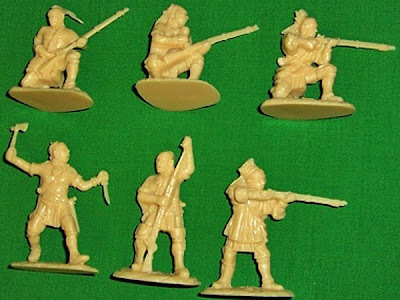 Most useful to modellers and wargamers in my opinion will be the two sets of Woodland Indians. 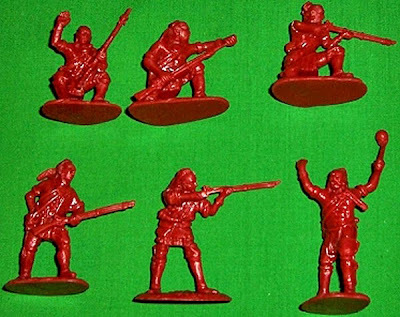 These are going to be popular with American Revolution and War of 1812 gamers as well as those with pioneer forts. The French figures look good and not too afflicted with the crazy action poses that a lot of plastic figures suffer from. The Rangers appear interesting and I should imagine will be able to represent various other light types and with a bit of work will convert to all sorts of things. This photo of Brett taken about 10 years ago is a great image from my box of old photos. (Before you say anything he's smoking a clay pipe - I've looked at it close-up and it is not a cigarette believe me). Not sure what the uniform is - looks like the Jersey Blues but I don't think it is. It captures that moment of getting up when you're camping in the woods in high summer - you can almost smell the wood smoke. Photo is taken in the grounds around the American Museum Bath which are well worth a visit if you're nearby. Don't forget the reenactment down at Westerham Kent celebrating the Wolfe 250th - details elsewhere on this site. While we are in the region of Vincennes (see below) I thought it might be worth talking about the original Long Knives - George Rogers Clark's Illinois Regiment. Made up of Virginia and Kentucky militiamen they were celebrated Indian fighters and are remembered as the Conquerors of the Old Northwest. 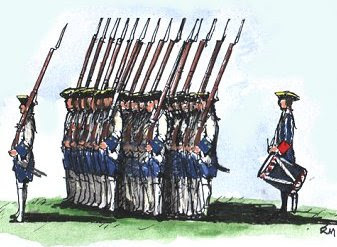 It seems that this formation was in the main uniformed despite the common image of them as frontiersmen - in uniforms made by first French and then Spanish (as this Don Troiani image of the 1782 uniform depicts) tailors. 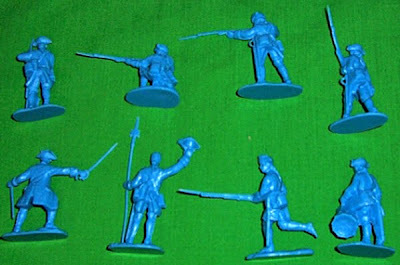 Weapons included Spanish muskets and these French-made grenadier sabres. Whether the name came from these swords or actual long knives that were issued I don't know...George Rogers Clark referred to them as 'Big Knives' in a speech. Information on the Illinois Regiment's uniforms and equipment are at this reenactment website which furnishes lots of information on the appearance, the myths and the reality. 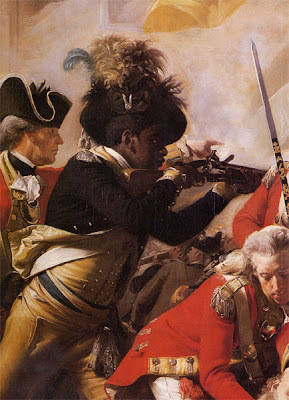 Read about the French-made swords and the picture's caption in Don Troiani's Soldiers of the American Revolution. Two well-known Quebec artists, a filmmaker and a playwright, look at various aspects of the story of the Battle of the Plains of Abraham. Whose version should prevail? Is history best served by documentary or fiction? This short film by Allan Wargon tells the story of the run-up and the battle that shaped a continent. 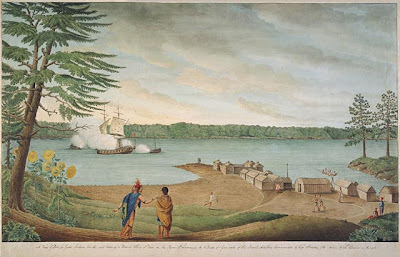 Pleasant slideshow of images from this event established in the 70s and is intended to introduce visitors to life along the frontier in late 18th and early 19th century Vincennes, particularly during the American Revolution. Details of the 250th anniversary Wolfe event on this weekend in Kent here. 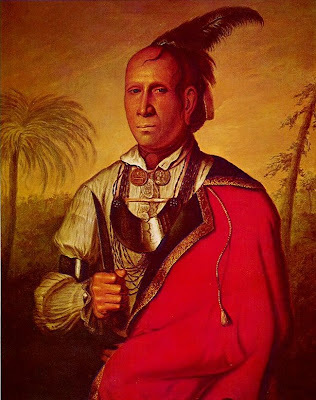 Of course when it comes to being painted I should think the most often committed to canvas was Mohawk Joseph Brant - see a host of the images here. 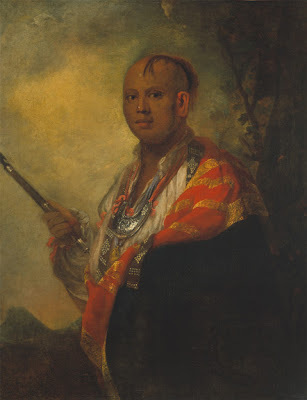 Another Cherokee from the same era who visited London is Cunne Shote, also known as Oconostota, painted by Francis Parsons (floruit 1763-died 1804) in 1762. Sometimes called Standing Turkey (his uncle) or Stalking Turkey. Memoirs of Lt H Timberlake on Google books - the memoirs describe the months he spent living with the Cherokees then escorting a delegation to London to meet King George III. He provides details of daily life, including ceremonies, games, the role of women, the preparation of food, and the creation of weapons, baskets, and pottery. This edition pairs the original text with extensive footnotes and annotiations, a new introduction, index, and more than 100 illustrations, including artifacts, maps, period artwork, and contemporary artwork. Someone who is part of the heritage of the area around Prickett's Fort (see below) is Ostenaco - a Cherokee. He visited London where he caused quite a sensation having his portrait done by Reynolds along with other drawings - see the Wikipedia entry for his life story and more pictures. British Gunboats capture French corvette l'Outaouaise during the Battle of the Thousand Islands. 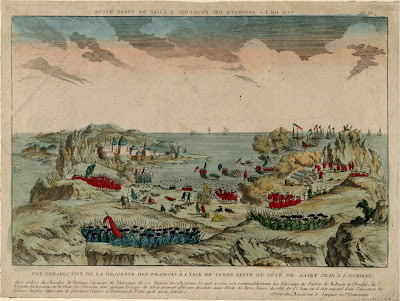 A View of Fort La Galette, Indian Castle, and Taking a French Ship of War on the River St. Lawrence, by Four Boats of One Gun Each of the Royal Artillery Commanded by Captain Streachy 1760. One of the few people to depict Rangers and Light Infantry was Thomas Davies - a Royal Artilleryman who captured the above scene among others. 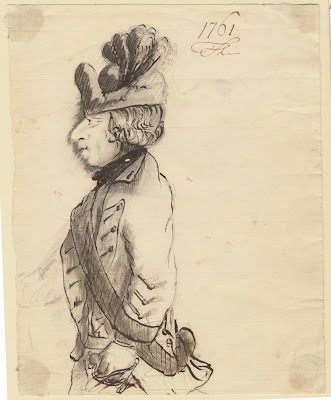 The army of General Jeffery Amherst, commander at Louisbourg and Britain's general-in-chief in America, en route to Montreal, to bring the end of French military power in Canada, September, 1760. 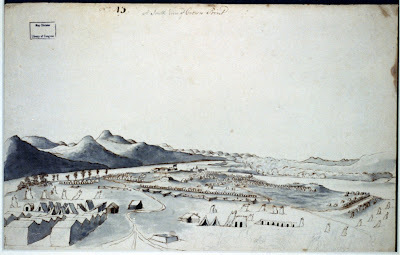 Another Thomas Davies A View of the lines and Ft. Ticonderoga with the encampment commanded by his excellency Major General Amherst in the year 1759 can be seen here at War on the Run's gallery. 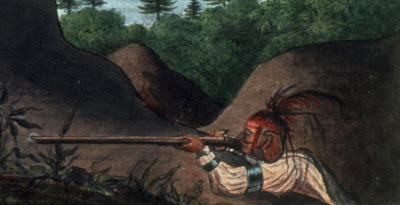 The most common musket during the French and Indian war for the British and their Yankee allies and still in use during the American Revolution was the Long Land Pattern. 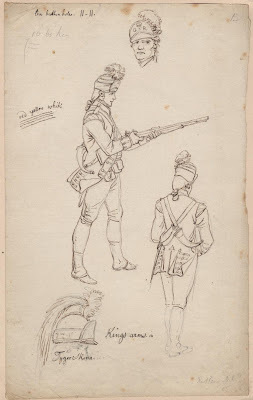 Sometimes called a 'Brown Bess', this term can't be documented before the 1770s though it's mention then seems to imply the term was already long in use by that time. Brown Bess wikipedia entry. Rangers are known to have sawn 4 to 6 inches off the length (excavations at Rogers' Island prove this). Captured stocks of this musket found their way into the hands of Canadians and Indians after the fall of Oswego. Still in use at the beginning of the Revolution for British troops though gradually replaced by a shorter version, the Short Land Pattern. This 18thc (I think) song that tells the tale of the battle of the Plains of Abraham is posted as a reminder that the 250th anniversary of his death is celebrated this weekend down at Quebec House Westerham Kent - his boyhood home. When I started the French and Indian war group in the UK a good few years ago now I tried to push this song as a camp fire singalong song - it didn't really work even though I carefully transcribed and printed out the lyrics. You can lead a horse to water... we did have some good camp fire sessions of song though - mostly standards like 'Drink old England dry' etc. Anyhoo you can join in now with this thanks to the internet and sing it round your digital fire instead. The words here are based on the Martin Carthy version which slightly differs from the one here but you get the idea. 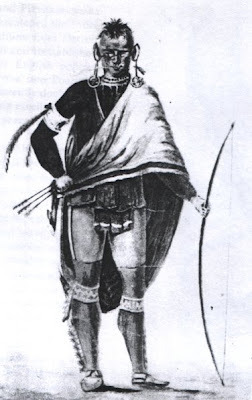 As today is the anniversary of the Battle of Lake George I thought we might as well feature one of the battle's combatants - and one who lost his life in the early part of the engagement - this man - a Mohawk sachem. 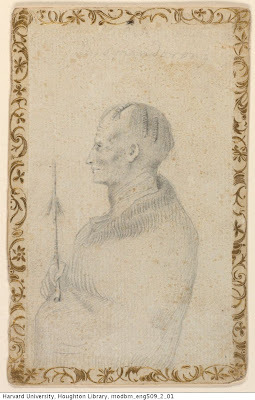 Often mistaken for another Mohawk called Hendrick who visited England and is one of the 'Indian Kings'. Read about this mix-up here. 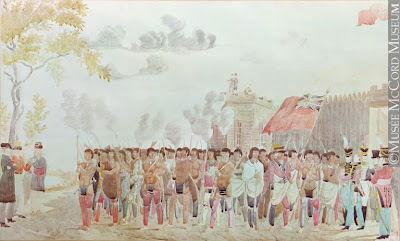 The background to the colour picture is obscure - some claim he visited Britain others where he met George II and some that this was executed in the Americas by an itinerant painter. Of course part of the reason why this battle is remembered is the fact that there were Mohawks on both sides. Another beauty sent in from the good folks at Galloping Major wargames. You've seen it in black and white - now see it in all its colourful glory. It's an interesting to think of what information sources were available to the artist back in the 1950s. Presumably Cecil CP Lawson would be the main reference and probably the Morier paintings but there wouldn't be the amount of documentation and information that we have become accustomed to these days. I first encountered the illustration below on the cover of Carl Benn's excellent book. 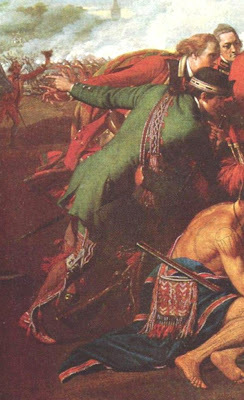 Carl Benn also contributed an excellent essay Iroquois warfare 1812-14 for the War Along the Niagara collection which is well worth tracking down. 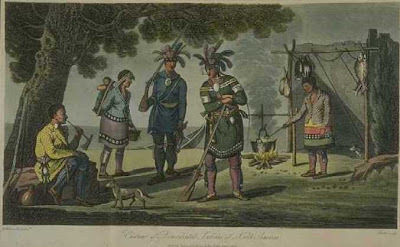 This one is "Costumes of Domiciliated Indians of North America"
George Heriot. Travels through the Canadas, Containing a Description of the Picturesque Scenery on some of the Rivers and Lakes.... London, 1807. A huge thanks to Lance Cawkwell of Galloping Major wargames for this image. Lance is a true Ron Embleton fan and has admitted he was an inspiration for his new range of F&I 28mms - there's a mohawk warrior they do which looks just like the standing figure. Anyway I'm sure you're all blown away by this image. 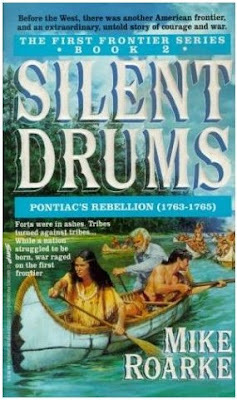 It's from a piece about Pontiac's rebellion - I've only ever seen a black and white of this and it really comes alive in its vibrant colours. If you want to see more there's a behind the scenes clip here that's pretty good. The American Revolutionary War was now raging. Rogers, no politician, might have fought on either side, but for him neutrality was unlikely. His British commission made him an object of suspicion to the rebels. He was arrested in Philadelphia but released on giving his parole not to serve against the colonies. In 1776 he sought a Continental commission, but General George Washington distrusted and imprisoned him. He escaped and offered his services to the British headquarters at New York. In August he was appointed to raise and command with the rank of lieutenant-colonel commandant a battalion which seems to have been known at this stage as the Queen’s American Rangers. On 21 October this raw unit was attacked by the Americans near Mamaroneck, New York. 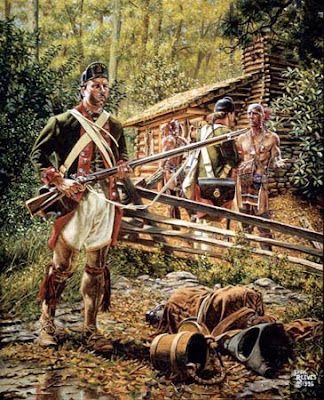 A ranger outpost was overrun but Rogers’ main force stood firm and the attackers withdrew. 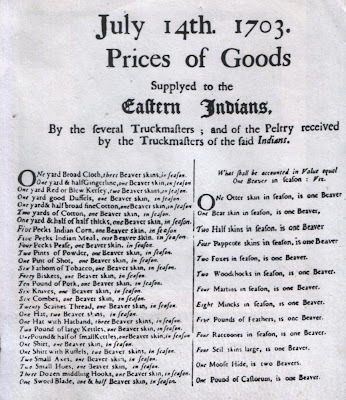 Early in 1777 an inspector general appointed to report on the loyalist units found Rogers’ in poor condition, and he was retired on half pay. The Queen’s Ran gers, as they came to be known, later achieved distinction under regular commanders, notably John Graves Simcoe. Rogers’ military career was not quite over. 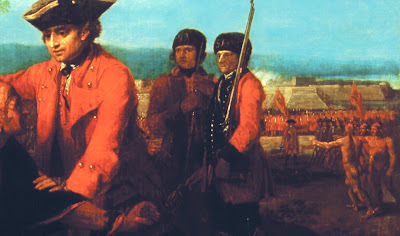 Returning in 1779 from a visit to England, he was commissioned by General Sir Henry Clinton – who may have been encouraged from London – to raise a unit of two battalions, to be recruited in the American colonies but organized in Canada, and known as the King’s Rangers. The regiment was never completed and never fought. The burden of recruiting it fell largely on Rogers’ brother James, also a ranger officer of the Seven Years’ War. Robert by now was drunken and inefficient, and not above lying about the number of men raised. 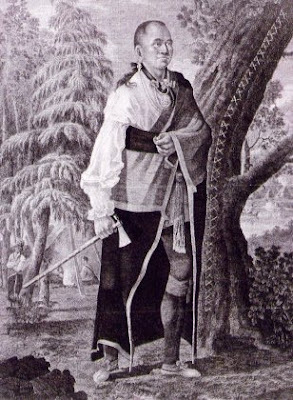 Governor Frederick Haldimand wrote of him, “he at once disgraces the Service, & renders himself incapable of being Depended upon.” He was in Quebec in 1779–80. At the end of 1780, while on his way to New York by sea, he was captured by an American privateer and spent a long period in prison. By 1782 he was back behind the British lines. At the end of the war he went to England, perhaps leaving New York with the British force at the final evacuation in 1783. I'm not sure where the original of this painting (thought to be Robert Rogers in the uniform of the early Queen's or the King's Rangers which he formed) is. It look like it uses the same old studio props in West's paintings and more. There is some who reckon the 'Ranger' in the Death of Wolfe is in a Queen's Ranger uniform of that time. There has always been a fair bit of doubt about this famous corps and what they wore. If you check the wikipedia there is an alternative put forward to the usual green-faced red with jockey cap image. The variation is this: 'Their uniforms consisted of a green woolen coat faced white and a white woolen waistcoat. Their pant garment was gaitered trousers made from Russia sheeting, a hemp product. Their hats were round hats, useful in shielding their faces from the sun. When in garrison or on parade, they could bring up the leaves of that hat to form a cocked hat. Their belting was black'. There's a painting by Don Troiani here with what the alternative might be like. There's an 8 page pdf file on the arguments for this which is an interesting read. At least the cartridge box plate seems to be a genuine item - as to the rest who knows? I am a big fan of the film Drums Along the Mohawk - it's one of the great 'Easterns' and has some John Ford magic aplenty in the characters and some of the scenes. The villain of the piece is 'Caldwell' played by the masterly John Carradine (pictured) - a loyalist who leads the Indians in the attack on the Martin's village. I have to admit that I have never read the book that the movie is based on despite the fact I have been told it's a classic but it seems that the character is based on the Butler's Rangers leader William Caldwell. He seems to me a fascinating fellow taking part as an officer in Lord Dunmore's war a year after arriving in America from Ireland. In the Revolution he was based at Niagara and according to his bio 'In the rangers’ campaigns Caldwell was “a very active Partisan,” according to the fort’s commandant. He led, rather than ordered, his troops into battle and he demonstrated a ruthlessness that the Americans would remember'. Victor at Sandusky and Blue Licks. He attracted a notoriety that didn't die down after the War was over and he was still 'public enemy number 1' for a lot of Americans in that part of the world for a long time. He didn't die like his implied end in Drums - he survived and lived a pillar of the community existence in Canada. He led a unit in the War of 1812 called 'Caldwell's Rangers' fighting at the battle of the Thames and lived on until 1822. This painting by West has some interesting detail going on in the background. 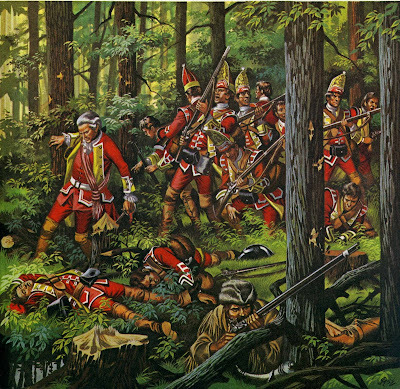 Two light infantry types with GR on their caps stand in front of a log and earth structure - in front of which stands redcoat and native warriors. 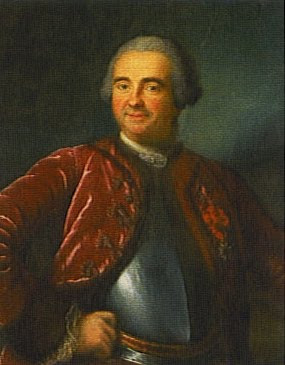 This painting was executed in 1764. See the whole picture and a very interesting comment on the fact that the picture may represent the Siege of Niagara. 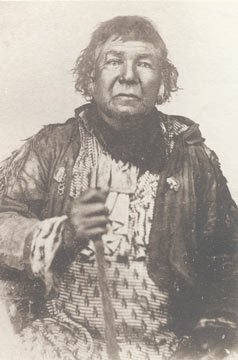 This man was an Ottawa tribe member who became a chief within the Potawatomi tribe in Illinois during the 19th century. It's rare to see a photo of someone who fought alongside Tecumseh at the Thames and took part in the Red Bird Rising (1815) and the Black Hawk War (1832). Drawn by Joseph Wabin in the Illinois country. Blue shirt and breechclout, red face paint, white blanket with blue stripe, red leggings, red garters with blue zigzag, blue bead necklace. 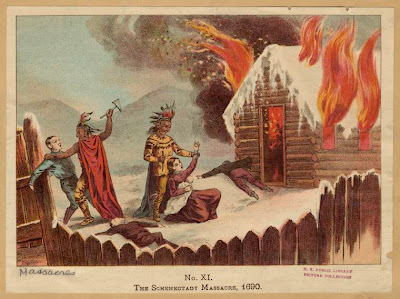 Today is the anniversary of the start this fight - fought between mostly Potawatomis and Americans in Indiana. The plot of this battle is like some western movie with a reduced, beleagured garrison being finally relieved by the timely arrival of reinforcements. Read about it here. It's not very often you find a sutler's website that is actually educational but this site Najecki Reproductions is a mine of information about the American Revolution with features on British lace and much more. 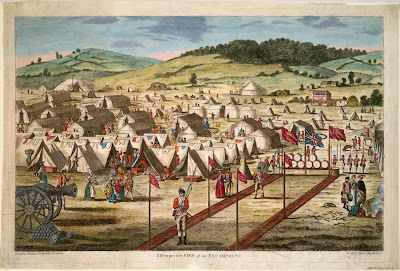 This page is very good with a whole array of images of encampments mostly from the AWI era. Here's something pretty exciting to watch - it makes me want to get on a plane and go join in...looks excellent. Interesting that their Compagnies franches use a dark blue - which is what I would go for nowadays...great piece of music in the background. Here is the maker's website - presumably it's the same reenactment group as this website - please correct me if I am wrong. Drawing by me. Back in the old days I used to do a lot of drawings of the F&I period - on the whole people were polite about them but I didn't care, I liked doing them. Nowadays I don't draw much but occasionally while digging around the boxes of photocopies and photographs that I have (remember the days before the internet and people used to send pages through the post?) I find one that I think is not that bad and this is one that I thought I'd share with you. A fort that was definitely not of the log and earth type was this one built at Crown Point/Point de Chevelure on Lake Champlain. Nowadays it is rather unimpressive (to a European like me) stone ruins but at the time of its height it must have been the most imposing structure in the region resembling a medieval castle as it overlooked its domain. Its cannons, that were on every level of the redoute, were capable of stopping all north-south traffic on the lake. The Anglo-Americans certainly wanted it gone and spent most of the Seven Years War mounting expeditions against it. 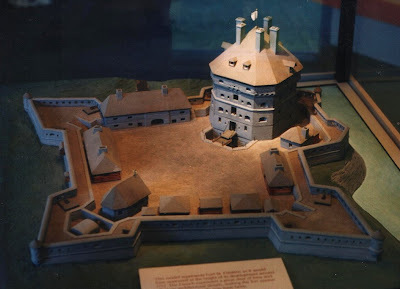 Finally the small French garrison abandoned it, destroying it and surrounding buildings in the face of a forthcoming Anglo onslaught coincidentally 150 years to the day that de Champlain fought the Iroquois at Crown Point in 1609. 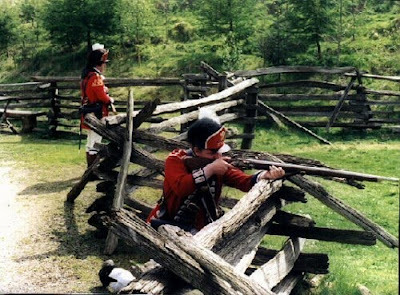 In its heyday it was the centre of a flourishing Canadian community as settlement was encouraged and in wartime it was the starting point of many expeditions and warparties against the British.